There's No Such Thing as a "Bad" Posture ~ Eat. Run. Rehabilitate. Many of us have been scolded since childhood to "sit up straight", to stop slouching, to keep our chins up and other various cues in attempt to hammer home "perfect posture" habits. 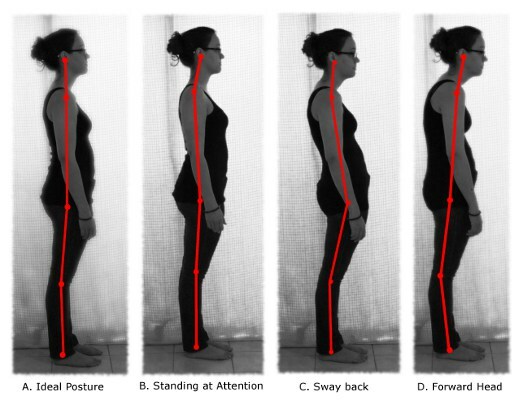 However, the more I think about it and think about human movement I start to think more about how there isn't really such a thing as bad posture. When I say this...I mean that there is nothing wrong with putting your cranium into a forward head position, nothing wrong with arching your low back, rounding your shoulders, and for you PRI people out there...favoring a Left AIC pattern. There are some clinicians, coaches, and parents that hammer home the importance of "proper posture" and even go to such lengths as bracing, taping, or even strapping down body parts to limit people into their ideal of perfect positioning. Remember the fcliche scenario with the girl in boarding school that must learn to walk and sit with a book balanced upon her head? There are also some clinicians and researchers that scoff at the idea of trying to place blame on posture for pain and injury because of some of the existing literature. The real problem or dysfunction I feel is often times the target of these "postural correction interventions" and that is limitations. I believe the only true "bad" posture is one that a person can not get out of very easily or very often. Prolonged limitations in movement or habitual overuse of a certain movement is where the problem is really located. My neck is supposed to go forward, my shoulders meant to round, my thoracic spine to slouch but they were never meant to stay in those positions. I want to be able to both protract and retract my shoulders, utilize the left AIC and then get out of AIC. We don't want to get stuck but most of us spend 90% of our life either laying in bed, sitting in a chair, or standing. There is very little variance for many people. We need routine, habitual movement through entire ranges of physiologic motion. I'm not saying we need to train or load our bodies at every range or in traditional "bad" positions. I am also not arguing that certain biomechanical alignments are better able to produce force, perform better, and be more efficient at reducing risk of injury. It might be flavor of the moment to talk about "play" but think about how children or even animals in the wild move about for instance. Their movements are often random, varied, and the interactions between each other and the environment is very dynamic. I think about movements like parkour, MovNat, the teachings of Pavel and Ido Portal as a step in the right direction but they are still the minority. I would love to play on an "adult" playground but unfortunately as I write that it sounds more like something that is advertised on billboards near truck stops or in spam emails. Take a second and think about it though...Can you touch your toes? When was the last time you got into a full squat, sat cross legged on the ground, hung from a tree branch, or did a bear crawl? These were all once routine and daily movements for many of us humans. We really do need to change our "culture" and ways of thinking when it comes to movement. It is entirely true when it comes to the human body and human movement that if you don't use it...you will lose it. Perhaps a better slogan would be, "Move It, or Lose It." We shouldn't be taping people's shoulders in place for 8 hours straight at work as much as we should be getting the person to move not just their shoulders or head but their entire body more frequently. We also shouldn't be blaming benign structural positions or postures necessarily. We need to go deeper and further back in time...If that makes any sense to you. You do not need perfect alignment or positioning at all times to be pain free, you are not doomed if you have rounded shoulders, and its okay to go ahead and slouch sometimes. There is a time and place for everything.